He was quite attentive and was able to draw on my medical history from multiple hospital sources. He has good computerskills to find medical records and treatment history. He spent a great deal of time with me. He was quite attentive and was able to draw on my medical history from multiple hospital sources. He has good computer skills to find medical records and treatment history. He spenta great deal of time with me. Dr. Dubey was professional and helpful. He asked questions and gave great feedback. Natasha was extremely kind and veryknowledgeable. I highly recommend them. Dr. Aditya Dubey completed his residency in internal medicine at the University of Pittsburgh Medical Center McKeesport, PA in 2004. He then sought advanced training in lung disorders as well as in taking care of critically ill patients. He did fellowships in critical care medicine at the University of Pittsburgh Medical Center in Pittsburgh, PA and pulmonary medicine at Graduate Hospital, Philadelphia, PA. Dr. Aditya Dubey has authored many abstracts and articles and has presented his research at conferences around the country. Dr.Dubey is quadruple board certified in internal medicine, pulmonary medicine, critical care medicine, and sleep medicine. He is a fellow of the American College of Chest Physicians. He is also a member of the Society of Critical Care Medicine. 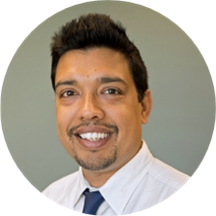 Dr. Aditya Dubey is a top Northern Virginia pulmonologist and sleep specialist based out of Dulles, VA with inpatient and outpatient diagnosis & treatments. He currently lives in Northern Virginia with his wife and son. He enjoys traveling with his family and exploring new areas. Learn more about our services. The doctor and staff are approachable and efficient. Doctor Dubey is nonjudgmental, listens accurately, and is able to convey thoughts clearly to a layman without patronizing...qualities every professional should have. in regard to hisspecialty, he is well versed. Follow up and follow through is well thought out and executed, which are critical. Kudos, and so glad to be under their care. I was very pleased with my visit that started with the front desk administrative assistant. She was very kind and very helpful. She was very pleasant. Then I met the doctor who was very much the same. He has a verynice bedside manner, listened and I did not feel that my visit was rushed. He is new to this area but very knowledgeable and helpful. Yes, I highly recommend him to anyone who looking for a pulmonologist.